Like many senior living communities across the country, the staff of The Terraces of Los Gatos works hard to ensure a safe and peaceful environment for their residents. In 2011, two primary concerns for administrators were the need to reduce pressure ulcers by ensuring a regular and auditable turning schedule for each resident, as well as the desire to reduce frequent audible fall alarms, which were bothersome to both staff and residents. 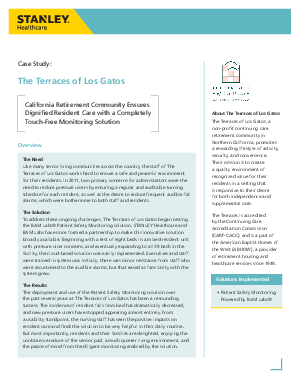 Read this case study to learn how The Terraces of Los Gatos ensures dignified resident care with a completely touch-free monitoring solution.